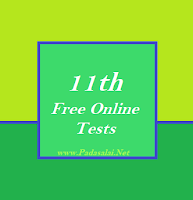 To help the students preparation for exams our website conduct free online tests for 11th standard ( Plus one +1 ) One Marks.Students can write these tests so many times (without any restriction) with free of cost. These tests are prepared on the basis of 11th text books - book back exercise with lot of creative questions also. It will improve the students achievement level and guide them to face the 11th public exams easily. So kindly use this 11th English medium free online tests frequently, and share this links to your students, friends also.